The Heartlight Saga by T. A. Barron. 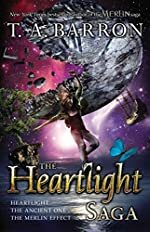 Review: One girl, Kate Gordon, and three fantastic adventures are featured in The Heartlight Saga. In T. A. Barron's Heartlight, the story tells about Kate and her grandfather's adventures. The Ancient One is about the adventures of Kate and her Aunt Melanie. In The Merlin Effect, Kate and her dad are the main characters. There are three different books published in one book so the readers will never have to wait to see what happens next. In Heartlight, Kate Gordon's grandfather creates something called PCL, or pure condensed light, which is in all stars. The sun and a distant star named Trethoniel are losing their supply of PCL and the only one who can save them is Kate and her grandfather. In The Ancient One, Kate and her Aunt Melanie venture into a crater, which is going to be stripped of its forest. As Kate tries to save it she travels back in time and gets stuck there for a while. Finally in The Merlin Effect, Kate and her father are traveling through the sea trying to find the Horn of Merlin, which can grant eternal life. But it is not as easy as it seems, because it is hidden in a ship that may or may not exist. T. A. Barron is an excellent author. He makes the characters in the book come to life. Each book is unique in what the story is about, but each book is tied together through the main character, Kate. Heartlight shows the bond between family members. It includes stories about science and is recommended for people that like sci-fi, The Ancient One shows magic and time travel, and The Merlin Effect shows the troubles between father and daughter and how they deal with the problems and resolve them together. It uses magic and mostly science to keep people reading. It is recommended for all readers between the ages 9 and 14 who enjoy science fiction and fantasy. The whole Heartlight saga is a great trilogy. That sends important messages through science, science fiction, and fantasy to interest any reader. We would like to thank T. A. Barron for providing a copy of The Heartlight Saga for this review. Have you read The Heartlight Saga? How would you rate it?